Map of the EuroVelo 6 long-distance cycling route, from the Atlantic coast to the Black Sea. EuroVelo 6 (EV6), named The Rivers Route, is a EuroVelo long-distance cycling route running along 3,653 km (2,270 mi) some of Europe's major rivers, including much of the Loire, some of the Saône, a short section of the upper Rhine and almost the entire length of Europe’s second longest river, the Danube — from the Atlantic coast of France to the city of Constanța on the Black Sea. The EV6 traverses 10 countries from Saint-Nazaire in France at the mouth of the River Loire, eastward along the Loire to the River Saône, across the border to Switzerland, along the Rhine to Lake Constance, north into Germany, down the River Danube and through Austria, Slovakia, Hungary, Serbia, Croatia, Bulgaria, and Romania to the Danube Delta, before terminating at Constanța on the Black Sea. 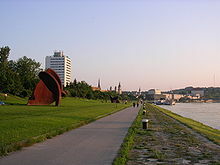 The EV6 includes the Danube Bike Path, the most popular holiday cycle route in Europe. This section stretches from Donaueschingen to Passau in Germany, through Austria to Vienna, and continues on to Bratislava in Slovakia, to Novi Sad and Belgrade in Serbia, before continuing on towards the Danube Delta. EuroVelo 6 route sign at Saint-Louis France, near both the Swiss city of Basel and the German border. From the Loire, the EV6 follows the Canal du Centre to the River Saône at Chalon-sur-Saône. It continues through Burgundy nearby to the grands crus vineyards through Besançon, Baume-les-Dames, Montbéliard, and to Mulhouse in the Upper Alsace. It then leaves France and crosses into Switzerland at Basel from where it follows the Rhine Valley to Lake Constance before crossing into Germany. From Tuttlingen in Germany, the EV6 follows the Danube Bike Path all the way to the Black Sea — though the Danube Bike Path actually starts a bit further upstream from Tuttlingen in Donaueschingen. The Danube Bike Path passes through Germany, Austria, Slovakia, Hungary, Croatia, Serbia, Romania and Bulgaria. It usually runs along both sides of the Danube, though sometimes it runs only along one side so that you must cross the Danube a number of times during the course of the route. The Danube flows through very diverse landscapes, including mountainous terrain and passes through a few nature reserves. The route passes several mountains, towns and monasteries, artistic buildings and geological features. Where the current crosses great plains, the bike path often runs along high water dams with extensive views, beginning in Lower Bavarian, northern Austria (e.g. Marchfeld) and finally in Hungary. From Lake Constance, the EV6 follows a route known as the Hohenzollern Route to Tuttlingen where it joins the Danube Bike Path. The rest of the EV6, all the way to the Black Sea, is one and the same as the Danube Bike Path, which in Germany is synonymous with the German Cycling Network's R6 Donauroute (Danube route). The EV6 / Danube Bike Path follows the rail corridor of the Donautalbahn (Danube Valley train) for long stretches — except in the region of the 5 train tunnels (Bahntunnel) that run between Donaueschingen and Ulm — so this offers the possibility to have a mix of journeys by train as well as by bike. From Scheer, the Danube leaves the Swabian alps and so the EV6 runs through the wide plains of the upper Swabian Danube valley. The route heads towards Ulm via Riedlingen, Obermarchtal and Ehingen, then leaves Baden-Württemberg and enters Bavaria. The route goes to Passau via Höchstädt, Donauwörth, Ingolstadt, the Weltenburg monastery, Kelheim, Regensburg, Straubing, Plattling and Vilshofen an der Donau. From Passau both the Danube and the route cross the border into Austria. After Obernzell a ferry offers the possibility to combine the border crossing with the river crossing. Rivers Route cycling path running along the Danube in Linz. The Donauschlinge, in Upper Austria, where the Danube does a hairpin bend. The northern Austrian section runs alongside the R1 Danube route while the southern Austrian section follows the R6 Danube route. In this section, there are paved paths for all but 100 meters on both the north and south banks with bridges, ferries and some dams linking the two banks. After the Lake Constance Route, the part from Passau to Vienna is the second most used bicycle route in Europe. About 630,000 people use the Austrian part of the EV6, and some 55,000 bikers do the whole 326 kilometres. The ADFC, which also analyses the traffic in the Austrian section since 2010, says that there was an increase compared to previous years. The route is typically travelled from west to east as it is down-hill with winds typically from the west. All along the way you will find delightful small towns, placid scenery, castles on the hills, monasteries, and excursions into woods and farm country. Downstream from Passau, you can choose to take the path south or north of the Danube. Southside it is recommended to visit the Schardenberg which has a platform that allows you to have an incredible sight over the foothills of the Alps. You may also pass some castles, as for example the Burg Krempelstein or the Burg Vichtenstein. On this way you will get directly to the Upper Austrian capital city Linz (European Capital of Culture 2009) with its three Danube bridges. The Lentos Art Museum, the Ars Electronica Center, the Brucknerhaus, the Tabakfabrik and the nearby Old Town with its pedestrian area and the cathedral can be found along the redesigned riverside promenade. This part of Linz is characterized by its modern art, including artwork from David Rabinowitch, Mathias Goeritz and Herbert Bayer. If you continue your journey on the Danube route, you’ll arrive at a flood dyke that offers a good sight of the VÖEST industrial estate and the pilgrimage church on the Pöstlingberg. One of the most scenic areas in Upper Austria can be found at the Donauschlinge Schlögen (a hairpin bend in the Danube, a double twist where the river changes its direction about 180°), in the Strudengau and on the north or "left" bank of the Danube river in the Wachau valley, which is a UNESCO World Heritage site. The KZ Mauthausen or the old Roman City Lauriacum are not only interesting but also historically important sights you may pass on your journey. After the village Mitterkirchen and the Stift Ardagger comes the city Grein, which is known for its old Theatre and its castle, Schloss Greinburg. Through the Vienna Basin, past the Devín Gate, the EV6 Rivers Route continues in Slovakia. Part III begins in Vienna goes through Bratislava in Slovakia and continues 306 km (190 mi) to Budapest in Hungary. Part IV of the path begins in Budapest and continues 1,670 km (1,040 mi) to the Black Sea in Romania. In this section it passes through Hungary, Serbia, Bulgaria (where it passes the UNESCO Heritage site Srebarna Nature Reserve) then into Romania to the UNESCO Heritage site of the Danube Delta, before following the Black Sea coast to end at Constanța in Romania. While the EV6 signposted in Serbia, signposts are lacking in much of the route through Bulgaria and Romania. There the route mostly follows streets; cyclists are advised to follow the allocated route. Route sign of EV6 and EV15 in Huningue, France. Route signs of EV6 and EV15 in Basel, Switzerland. Route sign in Ehingen, Germany. Camp site in Passau, Germany. Danube cycle path in eastern Austria. Cyclists waiting at a ferry crossing, Ufer, Austria. Crossroad of EV6 and EV13 (Iron Curtain Trail) in Slovakia. Route signs in Budapest, Hungary. Danube bike path route map, Novi Sad, Serbia. ^ John Higginson. The Danube Cycleway - Donaueschingen to Budapest. Cicerone. ^ "'Die ADFC-Radreiseanalyse 2013 – Zahlen, Daten und Fakten" (in German). Retrieved 2014-02-01. This page was last edited on 13 March 2019, at 21:59 (UTC).